A majority of Indian lenders are entangled in the Rs 11,300-crore fraud through issuances of unauthorised LoUs by PNB officials in connivance with firms owned by diamond merchant Nirav Modi. KOLKATA | MUMBAI: Import finance, crucial for ensuring critical supplies for India’s industrial and consumer needs, faces serious restrictions as banks clamp down on issue of letters of undertaking (LoUs) after a bunch of employees at Punjab National BankBSE -1.09 % were caught issuing fake LoUs in the country’s biggestever corporate fraud. Lenders such as Axis Bank, Canara Bank, IDBI Bank have either cut back on issuing LoUs or stopped them for certain categories one week after the scam unfolded. Some banks have also started demanding more documents and told clients to submit papers two days in advance. Earlier, banks used to extend buyers’ credit against LoUs within a day. The fund shortage forced importers to buy dollars in domestic spot and forwards market in order to keep their payment commitment to overseas suppliers. This pushed down the currency following which RBI intervened. Bank of BarodaBSE 1.68 % (BoB) issued a letter on Tuesday advising zonal heads to discontinue issuing LoUs or Letters of Comfort (LoCs) in favour of overseas suppliers or banks on behalf of the importer. Senior executives of the bank later told ET that it shut the system for two hours without prior notice in order to find out if there was any malafide intent as part of its systems check. But BoB’s clarification came too late and the news went viral forcing other banks to recheck rules and importers to rush to the forex market to cover their purchases. Some overseas branches of Indian lenders are either calling back earlier offers or have stopped discounting LoUs issued earlier. The problem has not just affected importers in the gems and jewellery sector but also other importers. Firms buying chemicals, computer peripherals have been told by banks about the new rules in issuing LoUs. Axis Bank has advised its customers to arrange LoUs at least 2-3 working days in advance. “Almost all overseas branches of partner banks (including those based in US) have advised that ‘same-day funding’ will not be possible and LoU must be received by them at least two full working days in advance to process funding. “Under the circumstances, all stakeholders dealing with customers (relationship and service teams) are requested to sensitise the importer customers about these developments,” the advisory says. ET has seen a copy of the letter. The note said that a few banks have withdrawn quotes pricing and ceased funding for all buyers’ credit transactions while a lot of banks have stopped providing quotes for new buyers’ credit transactions. It did not elaborate. “Axis Bank has necessary systems and processes in place to ensure compliance with the extant regulatory guidelines and reiterates its continued focus on working capital credit and trade finance businesses,” said Ashok Kumar Gautam, executive vice-president & head of financial institutions group at Axis Bank. “The bank has always placed the highest importance on due-diligence procedures in accordance with the regulations laid down by RBI and will continue to remain vigilant in its processes, at all times,” he said. Canara Bank did not respond to an email at the time of going to press while IDBI Bank could not comment citing non-availability of officials. Importers voiced alarm at the change in rules which would delay and increase cost of trade finance. “Importers with right credentials are also suddenly stuck because banks are refusing to open LoUs or overseas branches are either calling back their earlier offers or have stopped discounting any LoUs issued by Indian banks,” said KN Dey, managing partner at United Financial Consultant, a forex advisory firm. This squeezes their liquidity position, Dey said. “Indian banks are hesitant to extend such shorter-term credit overseas after PNB fraud. Banks are seeking a whole lot of documents from clients with whom they have been dealing with over the years. There is a panic,” said a senior official at a leading foreign bank. Banks have also tightened the customer verification process by seeking copies of bill of entry/certificate of origin / KYC of supplier, in addition to bill of lading and invoice. 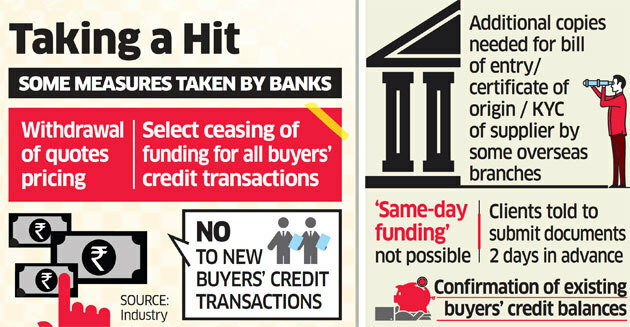 Confirmation of existing buyers’ credit balances also being sought by some banks. A majority of Indian lenders are entangled in the Rs 11,300-crore fraud through issuances of unauthorised LoUs by PNBBSE -1.09 % officials in connivance with firms owned by diamond merchant Nirav Modi. India’s largest lender State Bank of India has Rs 1,360-crore exposure to the fraud while UCO Bank and Allahabad Bank have Rs 2,656 crore and Rs 2,000 crore, respectively. These lenders have vociferously told PNB to honour these claims.